The BottleNeck Lounge opened on Valentine’s Day, 2007 with but one goal in mind: to be the best little neighborhood bar in Seattle. Since then the 845 sq ft watering hole has garnered accolades for its laid-back atmosphere, superb cocktails, and unusually outgoing staff. Whether you live within walking distance or are looking for an independent, locally-owned spot in which to relax, The BottleNeck offers something for everyone. Four rotating taps feature award-winning beers and ciders brewed predominantly within 60 miles of the bar’s front door and an array of locally-distilled spirits can be found on the shelves. The full menu, featuring bar snacks and panini sandwiches, is available daily from 4 PM until 2 AM and the side room is available for party rentals. Happy Hour features $4 pints of craft beer and cider, $4 well drinks, and $5 glasses of select wines. Manhattan Mondays: Classic Manhattans crafted with Evan Williams Bourbon are just $6 from 4 PM to 2 AM. Twelve Buck Tuesdays: Select bottles of wine are just $12 from 4 PM – 2 AM. Game Night: Join us every Sunday evening for Old School Nintendo on the big screen. 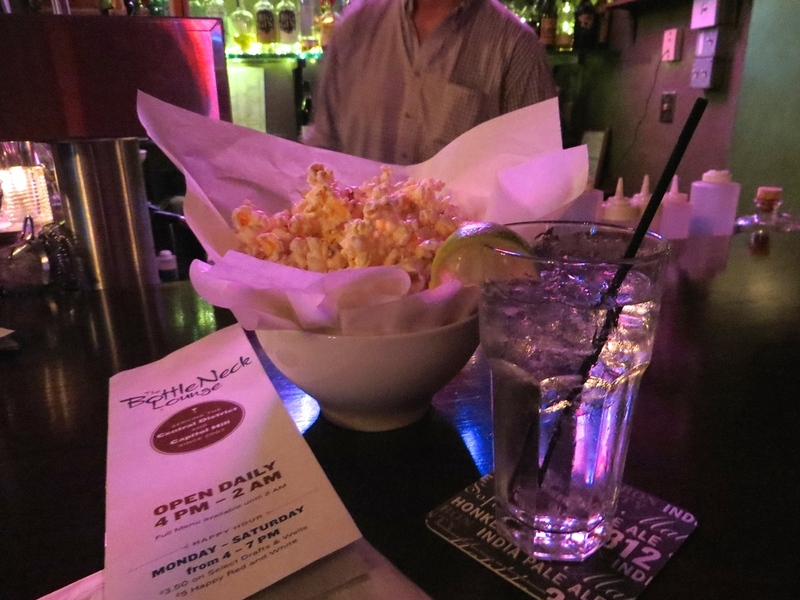 Enjoy our bar snacks & sandwiches or order burgers from Two Doors Down from your seat! Laird’s Applejack, honey, lemon, cinnamon stick. Served warm. Bourbon, Ancho Reyes Chile liqueur, crème de cocoa, chocolate bitters, orange twist. Served up. Vodka, Luxardo maraschino liqueur, orange bitters, lemon twist. Served on the rocks. Rye, St. Elizabeth Allspice Dram, lemon, ginger beer. Served tall. Goslings Dark Rum, lemon, pineapple juice, grenadine, orange twist. On the rocks. Bourbon, Drambuie, Fernet Branca, Peychaud’s bitters. Served up. Tequila, Del Maguey Mezcal Vida, chocolate bitters, orange twist. Served on the rocks. Gin, St, Germain, grapefruit juice, Peychaud’s bitters, lemon twist. Served up. The side room at The BottleNeck Lounge is available for rental for birthday parties, engagement parties and other special events. Perfect for groups of 30 or less and never a bar minimum. A TV is available as well.